The LSUHSC Bioinformatics and Genomics Program in collaboration with other faculty members in the Department of Genetics (Dr. Fern Tsien and Dr. Paula Gregory) and faculty from the Office of Diversity are developing a diverse array of Education and Outreach activities that share common overarching goals: to train the next generation of biomedical researchers, to increases workforce diversity and to eliminate socio-economic inequities and health disparities. From the left to the right Dr. Fern Tsien, Director Summer Science Program, Dr. Chindo Hicks Director, Bioinformatics and Genomics Program, Dr. Jude Crabtree, Director Genomics Core and Dr. Paula Gregory, Assistant Dean for Medical Student Research at the students summer research day presentation in 2017. We are accomplishing these goals through collaborative partnerships with Historically Black Colleges and Universities (HBCU - e.g. Xavier University, Dillard University, and Southern University of New Orleans) and other Universities in the Southeast and nation in developing and disseminating advanced yet accessible bioinformatics tools and genomic resources. We are accomplishing our outreach goals through an array of activities six of which are listed below. These activities embody multiple levels of Education and Community Engagement and Outreach. First, our LSUHSC BIG Program relies in large measure on having a fully integrated genomics and bioinformatics effort, and the interdisciplinary training we provide is critical to our success. Additionally, bridging the divide between genome sciences and unrepresented minority groups and the success of BIG in training the next generation of biomedical scientists relies on Outreach activities that connect the program to the community and the general public. 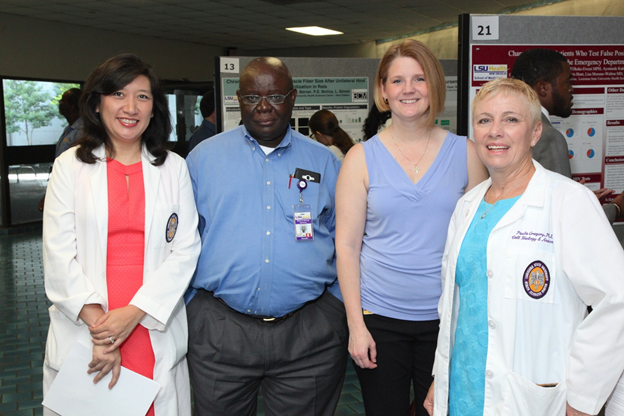 Our program complements larger Outreach initiatives at the LSUHSC. We are working collaboratively with HBCUs in development and deployment of a set of a bioinformatics tools that are accessible to students, faculty and biologists. We are focusing on deploying tools that widely adopted by the scientific community. The goal is to enhance bioinformatics and genomics development at those institutions. Not all HBCU are in New Orleans, therefore for all of our software tools we provide an informational web site. At this faculty from HBCUs and other institutions can download the software, and find information about the tools, including user guides, analytic protocols, and online tutorials. 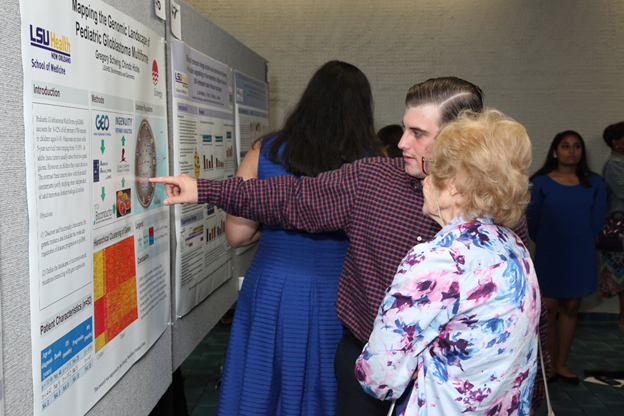 Mr. Gregory Schwing a Summer Bioinformatics Program participant explaining his research on genomics of glioblastomas to his grandmother during the students’ summer research day presentation in 2017. The BIG Program organizes and coordinates bioinformatics and genomics workshops and seminars for students and biologists. In addition to these workshops focused on use of bioinformatics and genomic resources, we encourage participants to bring their own data for hands on sessions where they use various online bioinformatics tools such as GenePattern, Pomello II or other relevant tools for analysis of gene and miRNA expression data. omics data. In these sessions participants may learn various steps in data acquisition, preprocessing, normalization, filtering, differential analysis and clustering and pathway analysis using different bioinformatics tools. In addition, we are developing capabilities for SNP, CNV and mutational analysis. The faculty members of BIG provide hands-on laboratory training in at the interface of genetics and genomics. 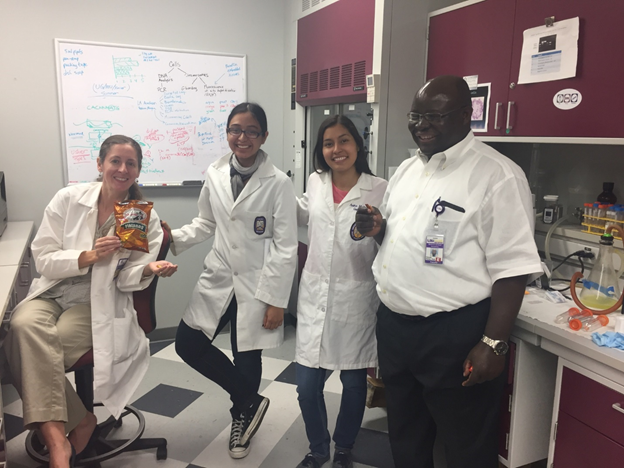 The purpose of the laboratory experience to provide undergraduate, high school and middle school students with a hands-on understanding of genetics and genomics experiments and data generation. This is done in labs run by experienced faculty who are members of the BIG. These labs also support the summer research experience programs. Dr. Hicks welcoming student participants from Mexico participating in the Summer Research Experience Program in 2017. As part of our outreach initiative and to connect in a meaningful way with as much of the community as possible. Although our workshops and seminars are effective, they reach only a small number of individuals. To broaden our outreach, the BIG staff have teamed up with BIG faculty members and directors of other programs to produce and disseminate via the Web, videos by experts in the field describing the opportunities and challenges in bioinformatics and genomics. This represents a new direction for the program, but one worth exploring. In addition, in recognition of the need for educating the public about consumer and public health genomics, we plan to produce multi-media presentations utilizing new communication and information delivery technologies. 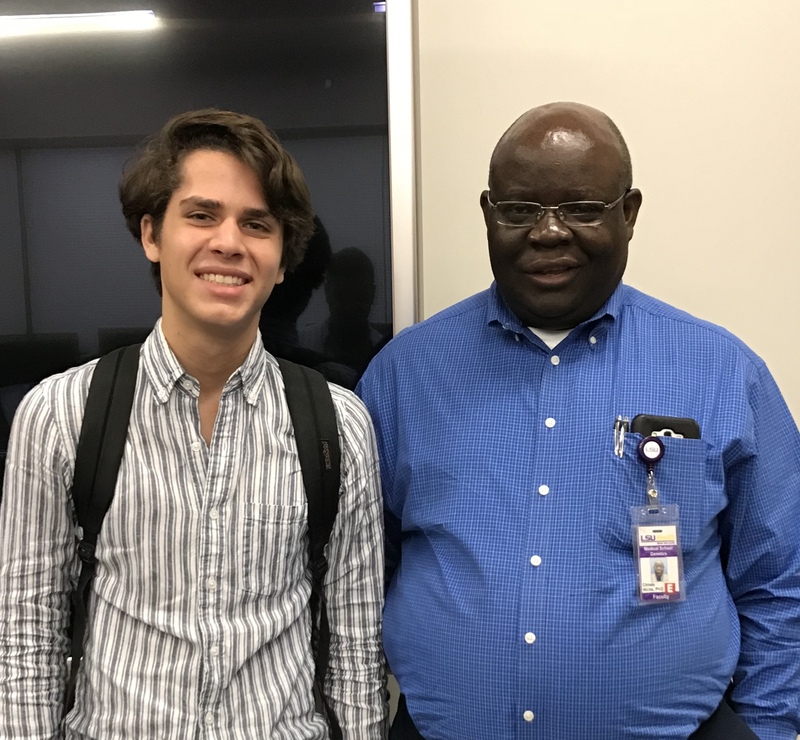 Mr. Bryce Monier (left) from St. Martin's school participating in Summer Bioinformatics Intern Program under Dr. Chindo Hicks (right). In partnership with the HBCU and high schools, BIG staff and members will go to those institutions to teach students and researchers how to use the bioinformatics and genomic resources most relevant to their education and research needs. The BIG staff offer a range of half-day and full-day modules, which can be combined to suit different audiences. The LSUHSC-School of Medicine has diversity initiatives aimed at increasing the representation of underrepresented minority groups in the field of genomics and bioinformatics research. These programs include the Summer Research Program in Science for undergraduate and high school students. This is a rigorous summer program introducing high school students and undergraduates to science. The BIG program is partnering with this program to HBCUs students interested in obtaining research experience, and minority students interested in pursuing graduate degrees in bioinformatics and genomics.